A small Korean knife called eunjangdo , literally "silver knife". 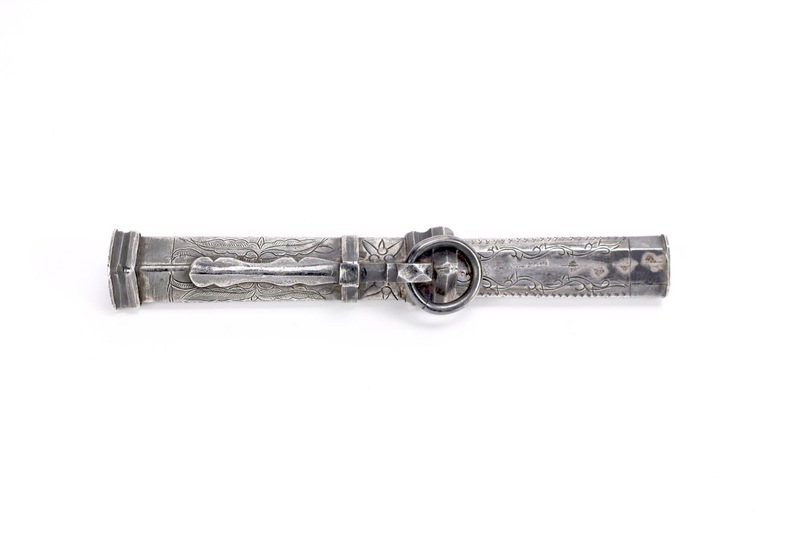 Very little literature exists on these, but there are some common stories going around that originate from Korea: These are generally thought to have been worn by women as utility knives, for self-defense, or to take their own life when there was no other option. Eunjangdo were by regulation only meant to be worn by the higher classes, who had the sole right to wear silver and gold ornaments. Another interesting function of the silver is that silver tarnishes quickly when it touches arsenic sulfides, which was a way back in the day to detect an attempt to arsenic poisoning. This is possibly the reason they often come with tiny chopsticks that seem too small for actual use. 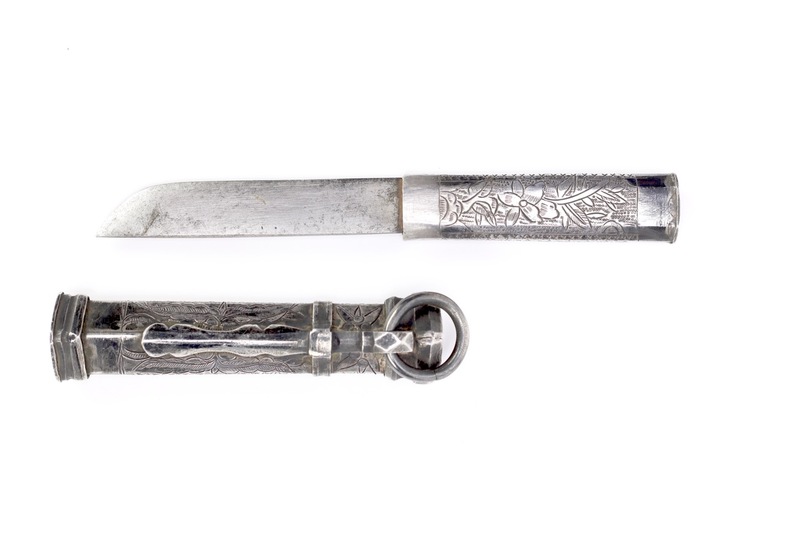 Antique Korean edged weapons are extremely rare, presumably because of the culture's own disdain for weapons combined with a large-scale disarmament under Japanese occupation. There is an interesting article on these eunjangdo on Korea Joongang Daily. A charming little Korean knife, of a rare type. 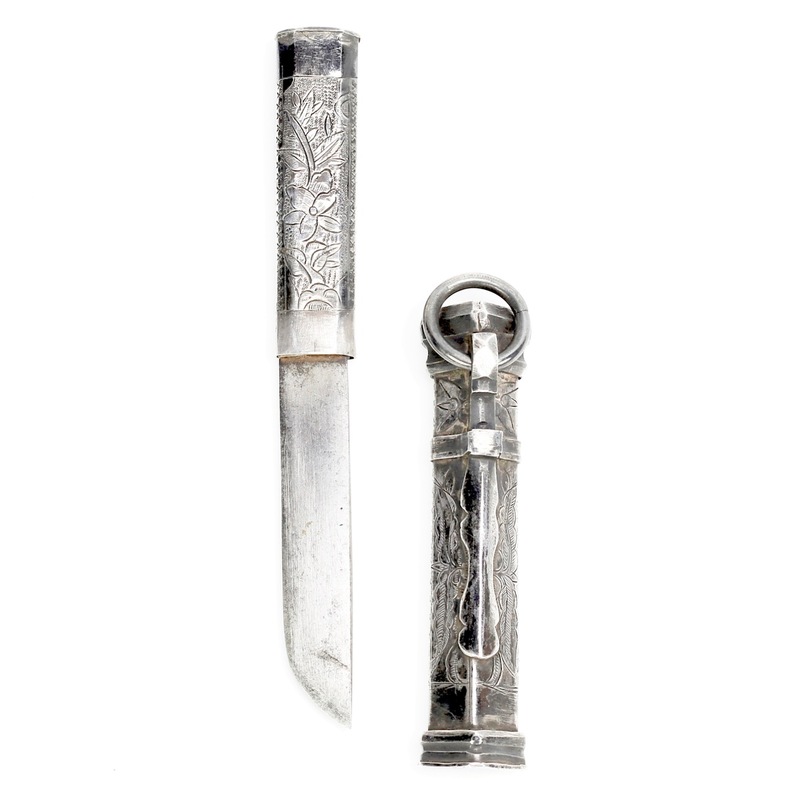 Its scabbard made of very thick silver, of high purity, with good weight in-hand. The silver is substantial, not light sheet silver. The purity was probably necessary for its poison detecting properties. It is engraved with floral patterns and geometric decoration. There is a tiny opening that once probably held tiny chopsticks, as these usually tend to come with. Unfortunately these are lost. The small steel blade shows signs of a forge folded construction, something seen on all serious edged weapons and tools from Korea, Japan, and China. 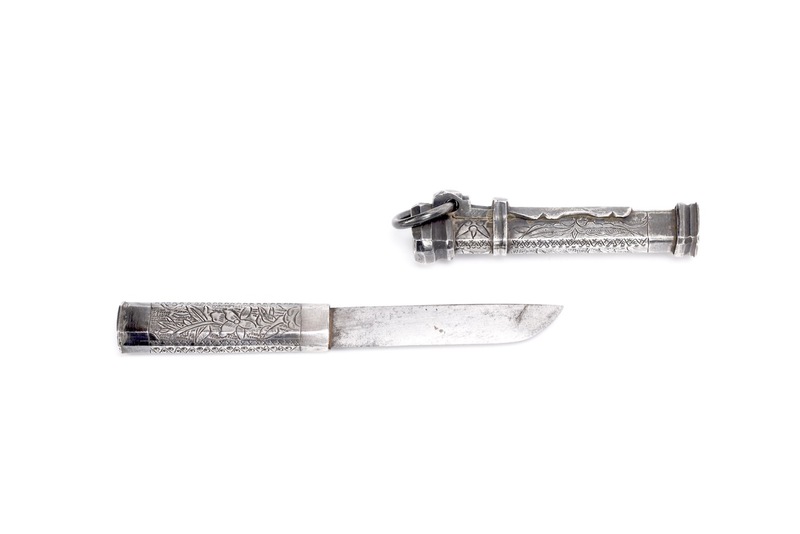 A nice example of a rare Korean knife, thought to have been worn by upper class women for various means of self-preservation.